Scotland's For Me: Westerwood Hotel Summer Offer - Book Direct! Westerwood Hotel Summer Offer - Book Direct! 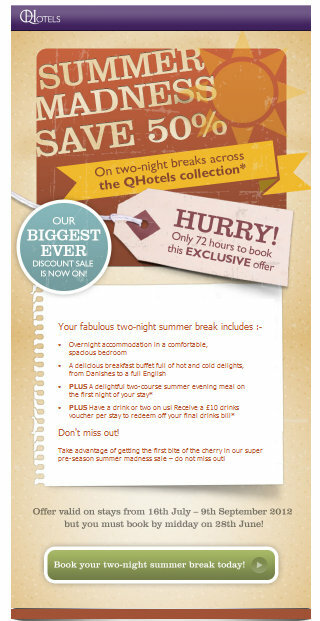 On the basis that our existence is aimed at increasing the number of people booking DIRECT with hotels, golf courses and attractions rather than paying inflated booking charges and commissions we're delighted to promote Q-Hotels Summer offer to Westerwood Hotel outside Cumbernauld. Even before it was part of Grant Sword's Morton hotels group a decade and more back we always had a wee soft spot for Westerwood Hotel and golf course and still often use it for meetings and training in Central Scotland - it remain possibly one of the most centrally located hotels for both Glasgow and Edinburgh airports and for tourism Scotland and offers really high quality accommodation, wining, dining and leisure facilities at great value for money. So here's the offer - click on the image to book direct with the hotel and see the range of Summer rates at Westerwood. It is our belief that we should be, wherever possible, highlighting the value of Booking Your Room Direct with Scottish accommodation providers. In the current market place it is all too easy for the visitor to stick to their preferred booking site - you know them all! - and just make that booking. Well we believe that there are a whole host of reasons for going direct and cutting out the middle man. That's not to say you should spend more on your trip but we do encourage you to have a look at the hotel's own website and check whether you are being offered the best available rate. If you Book Your Room Direct the accommodation provider can save up to 25% on the booking cost (even more if you're booking from a coupon site) and that can make the difference between investing in the hotel and not. We will continue to promote the Book Your Room Direct message wherever and whenever we can. "Away and Take a Run and Jump Into The Clyde"
Golf in Scotland? Yes But Where?